There are two points I have to make as I begin this review. The first is that as a book blogger I tend to overextend myself when it comes to accepting book requests. This impacts my reading for enjoyment and makes my TBR pile overflow. So I've decided to grab a book off of that pile every week and read it. This action leads to my second point. I have to lighten up on the way I rate books. I treat the five butterfly rating as some almost-extinct rating of all ratings. It isn't. It simply means I LOVE a book. And here is where I begin my review. 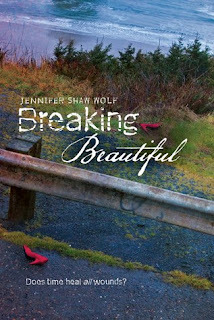 I LOVED Breaking Beautiful. Once I began reading this book, I simply could not put it down. I ate meals with it. While cooking, I kept it close so I could grab it and slip in a few pages. I stayed up late to finish reading. I LOVED this book! Why you ask? In one word it was all because of Allie. Allie had such a strong yet vulnerable voice. She made my heart break, made me tear up, made me root for her as though she was real. She got in my head and made a place for herself beside all of my favorite characters (and she's in good company along with Lizzie Bennett, Jane Eyre, Kathy and Heathcliff, Katniss, and more). Allie was sympathetic because of her past relationship with the wealthy, powerful and abusive Trip. She grew stronger as her story progressed because she needed to let go of her past once she remembered what happened that night. And she had help from a great guy named Blake. Throughout all of the story there was this gentle ripple of forgiveness. Allie needed to forgive herself for letting what Trip did to her go on. There were also ripples of healing and of admittance. Allie had to open up and grasp at the reality of what Trip did to her and the outcome of that fateful evening so she could start to heal. Time can heal all wounds, even those Allie had on her head and carried inside her mind/heart/spirit. There were other ripples about living in the present, being able to love and express that love freely, especially in a small town, and how small towns can corral people into behaving in a collective way. Allie was looked down upon because she was seen in public with Blake after Trips' death (that 'how dare she?' mentality). The story touched upon many typical social mores and its themes are highly prevalent today. A victim of abuse covers up the proof, believing the male when he apologizes and says his actions won't be repeated. Allie's recovery, both physically and emotionally, were gut wrenching and many scenes were powerful and moving. I have to commend author Jennifer Shaw Wolf for writing such a gorgeous, heart-breaking story and giving it life, passion and romance as well. Allie touched my heart as did Blake. It was nice to see Allie's parents and Blake's grandmother in active parental roles. Having the adults around only infused the scenes, making them richer and fully realized. The reality of Breaking Beautiful grabbed me. Allie could so many girls and the way she was able to rise above the stigma of being the girlfriend of the town's poster boy into her own individual who called a spade a spade was rewarding. I can't recommend this highly enough. Cover comment: Symbolic and different. Thank you:) We need to show our TBR more love but it's hard. I hope you get to read the book.